I dunno, it just feels like the author really likes using the phrase, “Cho Ryu Hyang adjusted/fixed his glasses”. It’s everywhere…. Jo Gi Chun tilted his head. Um Seung Do scratched his head. He didn’t expect much, but if the man even hesitated a little, he was about to persuade him make him agree. It didn’t have to be done, it seemed. He received permission from Jo Gi Chun quite easily. Um Seung Do came back out of the carriage, and walked up to Neng Ha Young. Um Seung Do nodded, and ordered his underlings to remove any traces of them being here. He then walked to the carriage. Jo Gi Chun and Cho Ryu Hyang boarded the boat. Seeing how this was a medium-sized ship, the interior was huge. There were 5 cabin,s and a kitchen. Cho Ryu Hyang felt that someone was watching him, while he was touring the boat. When he turned his head, his eyes met with Neng Ha Young’s. The girl whose red hair was flowing in the wind. This was the first meeting between Cho Ryu Hyang, who was to be called King Shura (修羅王) in the far future, and Neng Ha Young, who would be known as Hidden Fox (隱香狐狸). Their impressions of each other was quite interesting. He heard this from Um Seung Do, before he boarded the boat. 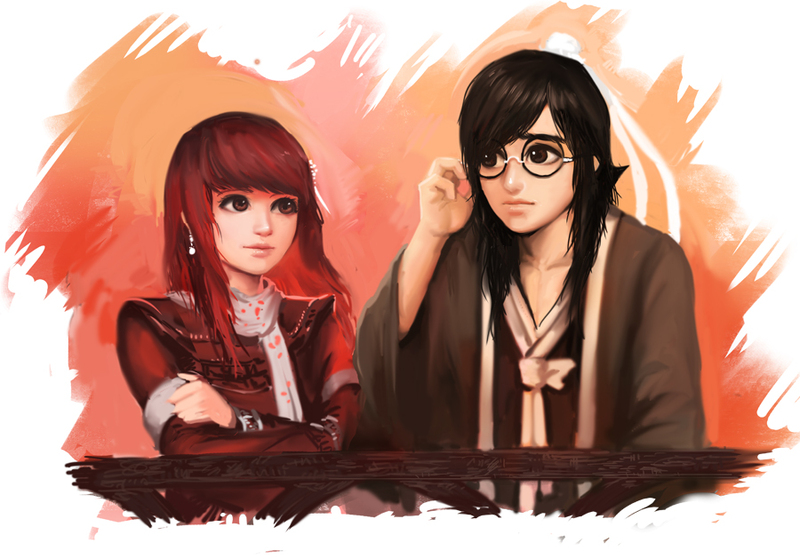 Cho Ryu Hyang observed the girl carefully, after fixing his glasses. The three sovereigns were very powerful. To think that she was a granddaughter of one of them…… Of course he would be focused on her. Cho Ryu Hyang was interested about it. So he started using the Faultless view without realizing it on the girl. At the same time, Neng Ha Young was observing Cho Ryu Hyang with a different thought. At the time, glasses were extremely expensive, and therefore couldn’t be worn by many. Who was that boy that possessed this object? What’s his relation with the Heavenly Demon Church? her curiosity sparked when she saw the boy. If he was traveling as a guest to the Qilian mountains, he should be related to the church in one way or the other. But the boy didn’t look like he practiced martial arts. Even so, Um Seung Do was treating that boy and his teacher with utmost respect. That’s why Neng Ha Young became curious and a little confused. The master of this boat was obviously a peak expert. To think that a mere boy would be guarded by an expert of this caliber. There was sure to be something going on. Neng Ha Young quickly recounted all the information stocked in her head. If you took a boat from Port Wuling, you could get to Castle Gansu straight away. If they then take a carriage from there for half a day, they would be able to get into the Qilian mountains. Obviously, their objective was to get to the mountains. Neng Ha Young already knew that the church was doing something on the mountains. The whole martial world was in an uproar about it, after all. But the thing was, she didn’t know what they were doing. Is there a need for the church to get into the territory of the Alliance to acquire something? Neng Ha Young started to think deeper. How’s the boy related to all this? He should be related to all this somehow, even if it’s not a direct relation. Right then, someone came up to her, and put a coat around her gently. Neng Ha Young woke from her deep thought when her bodyguard spoke to her. Neng Ha Young’s eyes sparkled. Elder Sang Dong Ha was an expert. A harmonious expert, at that. He was the one known as the Chasing Blood Lord (追血君) in the Fifteen Guests. There was something suspicious about the Heavenly Demon Church. The lack of information didn’t let them find out what exactly the church was doing, but something is bound to come out if they investigate enough. There would, of course, be danger that follow, but he would take care of that. Elder Sang Dong Ha was the leader of the elders that harassed Neng Ha Young’s father. Neng Ha Young hoped that something bad would happen to the elder because of this event. Neng Ha Young looked at Cho Ryu Hyang for a little while longer, and went inside. Jo Gi Chun smiled at his disciple, who was thinking about something on the deck. He thought that his disciple was taken by that girl. Cho Ryu Hyang stared at Jo Gi Chun with a confused expression. Jo Gi Chun didn’t know that Cho Ryu Hyang was thinking about something else at the moment. Cho Ryu Hyang’s head was full of surprise at the moment. The girl showed him the biggest number so far, when Cho Ryu Hyang used his vision. This came at Cho Ryu Hyang quite heavily. While Cho Ryu Hyang was spacing out because of this fact, Jo Gi Chun took something out from his pocket and opened his mouth. Cho Ryu Hyang took the paper his teacher gave him. On it, there were countless numbers arranged in a strange format. Cho Ryu Hyang stared at the paper. He was pleasantly surprised by what he found on it. Jo Gi Chun smiled, and nodded. Only Jo Gi Chun and Cho Ryu Hyang would be able to understand the meaning of these numbers. While they were moving in the carriage, Jo Gi Chun was constantly thinking. To be truthful, he still couldn’t trust these people from the Heavenly Demon Church. But the things that he wanted to talk about with his disciple kept increasing. For example, he wanted to talk about how the boy was able to activate the formation, how he was able to use the Disintegration steps, and etc. He had much to ask, and much to teach. But there wasn’t a way to teach him privately. So after much consideration, he came up with this. Thankfully, his disciple understood its purpose immediately. This made Jo Gi Chun immensely happy. There weren’t many that recognized the results that he came up with math. But his disciple recognized it. He felt quite proud thanks to that. Cho Ryu Hyang was pleasantly surprised by this, and Jo Gi Chun was equally proud of his disciple for recognizing this instantly. And that way, the two created a language only those two could understand. He knew that the two people were holed up in the passenger’s cabin. When Um Seung Do tried to see what the two were doing at first, he backed off in fright. The two people were exchanging papers full of numbers with each other, and were constantly solving something. The disciple was being constantly being surprised by something, and wrote something in response. The teacher was taking that paper, and was reading it with a proud face. Um Seung Do simply went to sleep, not even daring to approach the two people. He was supposed to use the private cabin, but because of the unexpected guests, he had to share the room with Jo Gi Chun. He knew Cho Ryu Hyang and Um Seung Do were quite discomforted by him, but it was the same for him, too. Having to stay with people he doesn’t trust was just torture. And he had to satisfy their needs, to boot. While Um Seung Do was trying to make himself sleep. Jo Gi Chun and Cho Ryu Hyang were carefully studying formations. Of course, the conversation was held in their own language. Jo Gi Chun paused for a moment after that, and wrote something else. A normal formation would use a gem containing the power of the heavens and the earth as a nucleus. Using that, the formation would naturally gain energy from its surroundings to open the Mystical Door and create a new dimension. But when Cho Ryu Hyang created his formation, none of this happened. There was no real way of knowing how the boy came across this method, but the boy would open the Mystical Door first, and then place the nucleus. The process was completely different from normal formation creation methods. This was quite an amazing achievement. He was thinking the same thing. The fact that he hid the fact that the old man was still there in his mind unsettled him for a bit. The old man told him to do so, but it did make Cho Ryu Hyang feel a little bad. The method was different, but they were essentially the same thing. Like that, the two both studied formations the whole day in the cabin. Cho Ryu Hyang came out to the deck, rubbing his eyes. Seeing the sun rising from the horizon, he assumed that it was dawn. His teacher was sleeping, as well as Um Seung Do. Cho Ryu Hyang, too, was lying down, exhausted, but strangely, he couldn’t sleep. Standing on the edge of the ship, he welcomed the cold wind that blasted his body. His stress seemed to dissolve a little that way. He took off his glasses, and leaned on the side of the ship. He then closed his eyes. Learning about formations from teacher was quite entertaining. It was fun approaching the world he didn’t know about, and he was overjoyed that he could focus learning math this way. No matter what others said, Cho Ryu Hyang liked math. He thanked the heavens for giving him this talent. While Cho Ryu Hyang took in the wind, someone approached him from behind. Cho Ryu Hyang came back to his senses, and opened his eyes. The girl known as the granddaughter of the Night Emperor, Neng Ha Young. Cho Ryu Hyang took out his glasses from his pockets, and spoke with an impassive voice. Neng Ha Young, hearing that, smiled. Cho Ryu Hyang wrinkled his eyebrows. Her statement was true, but it was too sudden. Neng Ha Young stood next to Cho Ryu Hyang, and talked. Cho Ryu Hyang was confused. Cho Ryu Hyang looked at Neng Ha Young, whose face was tinted red thanks to the rising sun. Neng Ha Young, too, was staring at Cho Ryu Hyang. When Cho Ryu Hyang said this, Neng Ha Young’s eyes widened in surprise. Cho Ryu Hyang felt a little annoyed for some reason when he heard that, but he decided to let it pass. Cho Ryu Hyang opened his mouth as he fixed his glasses. Cho Ryu Hyang didn’t hate the girl who approached him for some reason. So he opened his mouth with a lax look on his face. Cho Ryu Hyang stared at the girl without a word. Neng Ha Young didn’t try to avoid the gaze. It seemed that this girl’s personality was rather straightforward. But he didn’t expect her to ask just like that. After thinking a bit, Cho Ryu Hyang realized his reason for doing so, and smiled. If you gave someone something, you earned something in exchange. That was what a trade essentially was. Neng Ha Young nodded when she heard that. There’s nothing free in the world. When she thought that, she immediately wrinkled her face, as if she thought up something else. Cho Ryu Hyang had a startled look on his face. When Neng Ha Young laughed happily and teasingly asked Cho Ryu Hyang this, Cho Ryu Hyang began to observe Neng Ha Young in detail. After examining her as if he was grading a cow, he nodded. Again, it’s that age talk. Cho Ryu Hyang talked as he adjusted his glasses. This wasn’t an easy opponent. She couldn’t get anything just by provoking him. Neng Ha Young sighed again, and asked. Cho Ryu Hyang smirked at Neng Ha Young’s response. He knew who the girl was, and he also knew the value of the information she was asking for. He should then gain something that has an equivalent value to this information, but he had no intention of giving anything away just for money. Neng Ha Young put on a regretful smile. Neng Ha Young chuckled when she heard that. This kid was quite funny. She spoke. Finally, the question he was waiting for. Cho Ryu Hyang adjusted his glasses. He probably get some information regarding the martial world with this exchange. When Neng Ha Young heard what Cho Ryu Hyang had wanted, the composure on her face disappeared altogether. Cho Ryu Hyang actually wanted something that even she didn’t expect. What do you want…such a cliff hanger. Thanks for the chapter, Xiao Ensj! More power to your fingers. What a cliffhanger tho, it’s almost like every series chapter ends on one these days. “He knew Cho Ryu Hyang and Um Seung Do” think the second name was supposed to be his teacher’s. Fixed. Thanks for finding it. Every time I look at the illustration, my heart skip a beat… This illustrator is damn good! What’s even more amazing is the fact that the illustrator manages to pop out two of these drawings every week. W-what? Two every weeks?! How is that possible?! Damn… That’s a god of illustration if you asked me. Oooohhh! What did our math genius ask for?! Thank you for translating this ❤ to the translator and editor! First time I’ve felt the illustration to be quite inconsistent. She’s supposed to be 16, and him, 11/12. There should at least be one head’s worth of difference in their height, especially since girls mature faster than guys during puberty.